Last night I was making Rachelle's Peanut Chicken with naan. The girls love to help. I called Easy to pick up some ginger. I only needed a tablespoon worth and he bought a piece the size of my face. Anyone have a good recipe that requires ginger? you can freeze ginger. i usually peel it and cut into 2 inch pieces. well that should help with the nausea! I have a good SOFT ginger snap (I know, kind of any oxymoron) recipe that can't be beat. I asked A to stop at Quiznos on his way home from work and get me a sammy (or 3) for dinner. He called me from Blimpie. I cried (seriously. there is something wrong with me. I have GOT to have this baby). So he called me 10 minutes from Subway. What the heck? QUIZNOS!!! I know. I'm getting meaner by the minute. it's awful. Poor husbands. they can't do anything right! lol...the size of your face. that's hilarious. gosh, I really don't know. I honestly don't know if I've ever purchased real live ginger. I did have a mean ginger snap granola the other day though, yum! hahaha...okay i really started laughing out loud when i saw how HUGE that piece of ginger was!!! let me know what yummy recipes you find with ginger. a cook at my work makes up some salmon with ginger and it's AMAZING....maybe if you are feeling fishy you could find a good recipe for ginger salmon????? last time I went to buy ginger I thought it was crazy how they only sold it in LARGE chunks. Who uses that much!? Ava looks so cute with it- it made me laugh! Ginger is yummy in a ton of Chinese dishes....I don't have my cookbooks unpacked yet but try looking up some yummy asian dishes! I know it keeps really well...so you have a lot of time to think of things! Banananutmeg's comment cracked me up! I know the feeling! Oh my gosh. 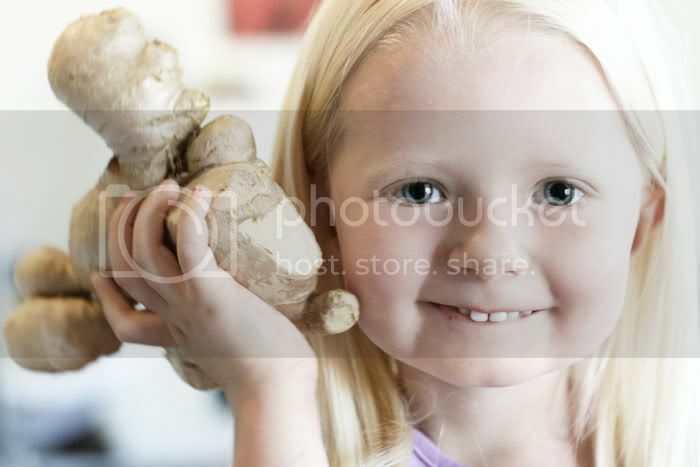 That is the biggest piece of ginger I have EVER seen! I agree with whoever said to freeze it, although I have tons of recipes too if you still need some!